The craps game is maybe one of the fewest games that offer you the possibility to watch a certain session without playing. It is a common procedure, and you won't raise suspicions by doing so. This way, you will have to possibility to see if the table is "hot" or "cold" and you will have to enter only when you are certain about your winning possibilities. The craps game has its ethics and behavior codes. Yelling or even whispering a certain number before the initial throw is rude, and the experienced players at the table will surely feel offended. As some aggressive players are using this technique to annoy the opponents, a gentleman would never think about recurring to those methods during a craps game. Although it is not mandatory to hit the back of the table with the dices, it is recommended to do so. The other players would laugh at you if you are throwing the dices slowly, and they will say that you are "feeding the chickens." Some other unwritten rules are also saying that you must throw with only one hand. Again, it is not against the rules to throw using both hands, but the other players at the table consider this an offence, or a sign of experience lack. Although the majority of caps dealers are experienced, they might make some mistakes. Some of those mistakes are connected with the dice throwing technique while other mistakes might be about placing the bets on their respective sections. Talk to the dealer in case this happens, even if you are an unknown player at the respective table. Of course, a true gentleman would tip the dealers continuously. It might be surprising, but the dealers aren't so well paid. Therefore, the client's tips are earning their livings. Don't be cheap, especially when you are winning. Moreover, the dealers might decide the faith of a certain game using someâ€¦unconventional methods. Always let the ladies to decide their places at the table. As said before, you are allowed to watch a table before gambling on it. If a lady decides to join a table, you should ask her about the desired place. After all, your earnings are decided by your luck and experience, not by the chair you are sitting on. 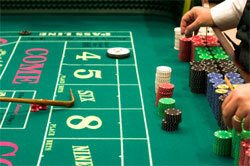 Those unwritten rules of the craps game must be followed by the beginners. If you were looking at the craps hall of fame, you would only see real gentlemen there. Craps isn't a game for drunken yelling players, and you can be sure that those players would never win serious money from craps.